· High level panels featuring actress Shabana Azmi, Member of Parliament Meenakshi Lekhi, Avinash Kumar, Director Programme and Policy, WaterAid India, Dr Jennifer Butler Deputy Regional Director, United Nations Population Fund (UNFPA) and more voice their support for greater action against the period taboo. · Megastar Akshay Kumar turns rock star as he sings about Menstrual Hygiene Awareness and honours Pad Heroes from across India for their work. · Attendees pledge their support for the Chain of Niine and to be a part of the Pad Man Army to break the period taboo. To mark World Menstrual Hygiene Day, megastar Akshay Kumar and a host of activists, politicians, advocates and national change-makers came together to launch the Niine Movement, an ambitious five-year plan aimed at tackling the taboos surrounding menstruation. With the announcement of the Chain of Niine at the inaugural Niine Menstrual Hygiene Awareness Conclave in New Delhi, India, the nation-wide movement aims to raise awareness on the importance of menstrual hygiene across the country. The Menstrual Awareness Conclave saw renowned film personalities, academics, policymakers, government officials, activists, medical experts, business stalwarts, NGOs, and thought-leaders, convene to discuss the impact that stigma and taboos have had on menstruation, and which have held girls and women back for centuries from achieving their potential and living a life of respect and dignity. Supported by Television Partner and leading Hindi news channel News18 India, and online partner Firstpost, the Menstrual Awareness Conclave saw two keynote panels take place providing an essential platform for collaboration, innovation and cooperation as panelists discussed sustainable solutions for tackling menstrual issues across India. Indian superstar Akshay Kumar, who’s most recent award winning film Pad Man tackled the issue of menstrual taboo, recently began his support of the Niine Movement with the launch of the nationwide campaign #18to82 to bridge the gap between the minority that are able to adopt hygienic practices and the large majority who are not able to make an informed choice in these matters. As one of India’s most respected and reputed social change and women’s empowerment advocates, Akshay Kumar took to the stage to interact with the audience, sharing never before heard experiences of his time filming Pad Man and explaining why he was so compelled to not only star but produce a film on periods. In one of the most memorable moments of the conclave, he also performed a rock anthem about menstrual hygiene entitled ‘Let’s Talk About Periods’, which encapsulated the enclave’s strong message on breaking the menstrual taboo and starting a discussion around. As part of the Niine Movement’s commitment to educate and raise awareness of menstruation across all genders and age groups, Akshay Kumar also spotlighted the work of menstrual hygiene champions – Pad Heroes - from across India. 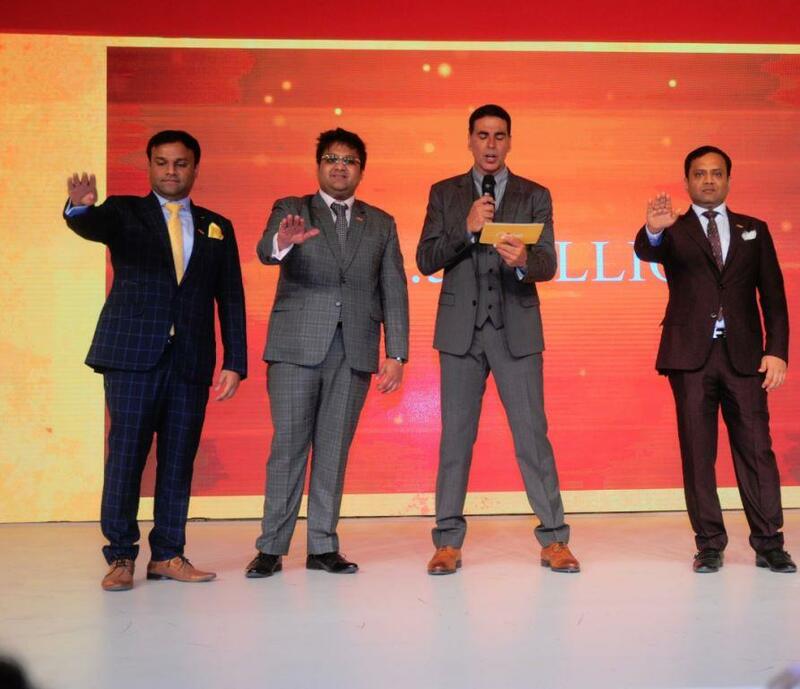 These Pad Heroes from a variety of backgrounds shared their extraordinary efforts to improve menstrual hygiene awareness in their local communities, and were presented with 5 Lacs by Akshay Kumar on behalf of the Niine Movement to support their continuing work. The Menstrual Awareness Conclave also featured two high-level panels engaging prominent and expert panellists. The first panel was Chaired and Moderated by Poonam Muttreja, the Executive Director of the Population Foundation of India (PFI), which has been at the forefront of policy advocacy and research on gender, population, health and development issues in India. With taboos surrounding menstruation preventing women and girls from achieving empowerment, respect and dignity for centuries, the first panel delved deep into the socially constructed origin of the menstrual stigma and the physical impact this can have on girls and women, in particular reproductive and urinary tract infections. If neglected, these infections can have long term consequences including increased vulnerability to other infections and in extreme cases can leave women vulnerable to infertility. Poonam Muttreja spoke to eminent panellists focusing on the importance of menstrual hygiene management awareness and practice and the work already being conducted on ground to tackle the issues and address the barriers. Some of the panelists included film actor and women’s rights activist Shabana Azmi, Avinash Kumar, Director Programme and Policy, WaterAid India, an NGO which aims to transform the lives of the poorest and most marginalised people by improving access to WASH (Water, Sanitation, and Hygiene) services, Nishtha Satyam, Deputy Representative, UN Women India MCO, Meenakshi Lekhi, Member of Parliament (Lok Sabha) from New Delhi Constituency, BJP National Spokeswoman, Supreme Court lawyer and socio-political activist and Dr. Jaideep Malhotra, President of the Federation of Obstetric and Gynaecological Societies of India (FOGSI). According to UNESCO, 20% of girls drop out of school upon reaching puberty the second, most common cause of absenteeism after household work. The second panel will focus on the safety and security of girls after they reach puberty in the school environment, an important concern for girls and their families that needs to be addressed in building a healthy ecosystem in which girls and women feel empowered to make healthy choices with respect to menstruation. Chaired and Moderated by activist and the Regional Coordinator, India of the Royal Commonwealth Society, Shivani Wazir Pasrich, the panel featured educationists and menstrual hygiene management experts to discuss the challenges within the education sector, which included the need for separate toilets for boys and girls with access to clean water, and the importance of advocating for better menstrual health practices at schools. The panelists included Dr Bindu Rana, CEO and Founder of Millennium Education Management, the largest education company in India, veteran educationist Lata Vaidyanathan, Director, TERI Prakriti School, woman empowerment champion Raseel Gujral and Dr. Jennifer Butler, Deputy Regional Director, United Nations Population Fund (UNFPA) Asia Pacific and OIC UNFPA India and Bhutan. UNFPA has been assisting the Government of India in addressing adolescent health concerns, improving access to life skills education and health services, strengthening delivery of SRH services and advancing reproductive health and rights and preventing gender discrimination and harmful practices. The Niine Movement is supported by Jagran Pehal and Radio City.